Bayside Grille: an elevated, open-air gourmet yet casual restaurant. Come dine in an island atmosphere at the Bayside Grille with its all-glass panoramic view of the Florida Bay, and its bistro-style open kitchen. 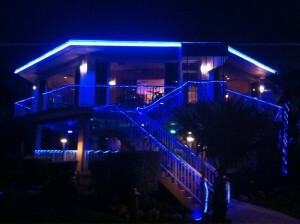 The restaurant is a waterfront extravaganza that you have got to experience while in Downtown Key Largo. We offer fresh local seafood, dailylunch, dinner and wine specials. Bayside Grille, at the water’s edge has become a local’s favorite and because of our expansive views and great cuisine, we have the most-photographed sunset in Key Largo!